Munich - A 1-1 draw against ten-man 1. FC Nuremberg in the 185th Bavarian derby between the two sides will likely prove to be no more than a blip on FC Bayern Munich's record come the end of the season. However, there was no disguising the frustration felt by the record titleholders come the final whistle on Saturday. Head coach Jupp Heynckes may have been comfortable declaring that his side, much-strengthened over the summer, "can't win every game", but in rotating his starting line-up the 67-year-old merely threw a spanner into what was a well-oiled machine. The league leaders got off to a perfect start when Croatian striker Mario Mandzukic bagged his ninth goal of the season inside three minutes but, despite establishing an early control of proceedings, Bayern's distinct lack of urgency offered Nuremberg an unlikely invitation back into the game. "We started well and scored a deserved goal in the first half," explained Heynckes, who is yet to name an unchanged side this season. "Then we missed the opportunity to score the second and maybe even third goal." Considering the fixture is one of the season's biggest in the eyes of their Franconian counterparts, Bayern's apparent complacency was somewhat bemusing. Instead adding zip, the fresh legs simply looked out of place as die Münchner struggled to implement their normal free-flowing game, "the logical result of which was that we were punished at a psychologically difficult time", according to Heynckes. Nuremberg's equaliser, a swerving long-range effort by Bayern youth product Markus Feulner which FCB keeper Manuel Neuer got a hand to but couldn't keep out, was a blow to the system that the record titleholders were unable to recover from. "We're frustrated that we let two points slip," said Neuer. "In the second half I had to deal with two difficult chances. The first was incredibly tricky, the second [a header from Sebastian Polter, ed.] was as well, but I managed to stop the effort on the line - but nobody will remember that one." Either way, it wasn't Neuer's debatable reactions that cost Bayern all three points, rather the midfield, where the illustrious visitors never really got to grips with Nuremberg's physical style of play. 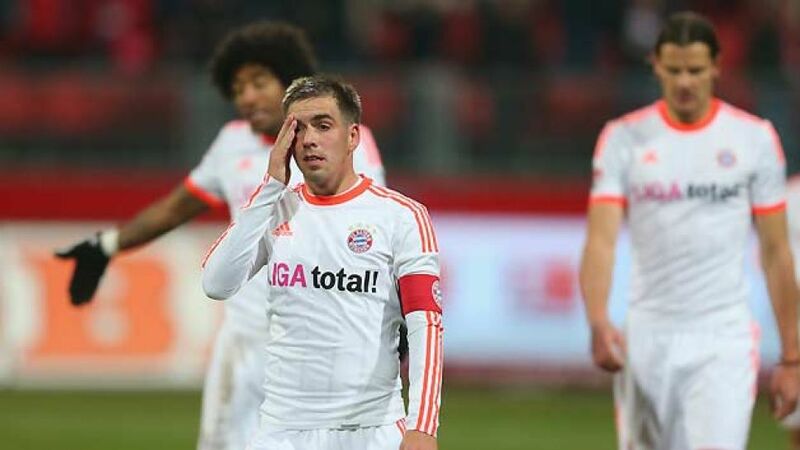 "We committed fouls too, but they often targeted our bodies," said Bayern midfield motor Bastian Schweinsteiger, while club captain Philipp Lahm claimed: "It's not easy when you're always getting kicked. It wasn't much fun for us." Similar to their UEFA Champions League defeat against BATE Borisov a few weeks ago, the 21-time Bundesliga champions struggled to find an escape route from Nuremberg's pressing game. Bayern conceded possession with alarming regularity, while Mandzukic cut a lonely figure up front. On the plus side, there was one bright spark for Bayern in the form of Swiss international Xherdan Shaqiri. The bitesize winger's performance was head and shoulders above those of his colleagues, his mazy runs and clever passing causing the hosts all sorts of problems. Unfortunately it was often a lack of support in advanced areas that prevented the 21-year-old from having a greater effect on the game. Strength in depth is, of course, healthy for any ambitious side, but on Saturday it worked against Bayern as the alterations threw them out of sync. "For a side full of confidence, they weren't as good as we thought they would be," confirmed FCN's returning keeper Raphael Schäfer. In spite of the outcome, die Münchner still managed to distance themselves from the chasing pack as Schalke squandered the opportunity to close the gap on the league leaders. However, Bayern undoubtedly revealed a previously-unnoticed vulnerability which may yet make for a closer-run title race than many had been predicting.